This minimalist series of fittings impresses with its cylindrical bodies and its rectangular and flattened levers, which are elegantly combined. With the two selectable surfaces chrome and supersteel, it is up to you to decide whether you prefer to complement your bathroom with shiny or matt fittings. The often symmetrical appearance of the individual elements and the slender silhouettes ensure a simple yet chic appearance of the faucets - relaxation for the eyes even before the use. Also, the honor with several design awards, including the good design award USA, show the appealing design. In addition to the design, Lineare also convinces with practical innovations: the Grohe Starlight surface creates lasting highlights in the bathroom and can be easily cleaned with a dry cloth. In addition, the operation of the faucets is extremely smooth thanks to the Silk Move cartridges. 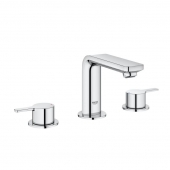 The washbasin faucets of the product line Lineare are available as standing fittings or as wall fittings. The standing variants are available in sizes XS (155 mm), S (180 mm), L (252 mm) and XL (356 mm). The size XS is particularly suitable for small washbasins and guest toilets. Size L has a different design than the remaining sizes. Here, the spout sits on top of the faucet and the handle is attached to the side, which eliminates the symmetry and brings variety into the series. In addition, a larger space is created under the faucet, because it is swiveling by 90°. The size XL is best for freestanding wash bowls. The one-hole faucets can be installed both with and without rosette. As a standing version, a three-hole basin mixer is also available, in which the handles point outwards, creating a symmetrical fitting. For wall mounting, a two-hole basin mixer with two selectable spout lengths (149 mm and 207 mm) in chrome and supersteel is offered. The base plate is a rectangular rosette, what creates a harmonious combination of round and angular elements. All in all, Lineare washbasin faucets present themselves with cylindrical bodies, a D-shaped and rounded down spout and a keyhole-looking handle, which is flattened at the front. In part, helpful innovations such as the energy-saving function (the handle's center position lets cold water flow) and EcoJoy with a limited flow rate to 5.7 liters per minute are used. The adjustable aerator ensures optimal usability of the water jet. Also available in chrome or supersteel, the Lineare bidet faucet will soon appear in your bathroom. Its shape resembles that of the washbasin faucets: cylindrical body and D-shaped spout on which a ball-joint jet shaper is additionally attached, with which the water jet can be adjusted (tiltable by 40°). With 145 mm the bidet fitting is smaller than the size XS of the washbasin faucets. For the shower, single-lever shower batteries are available for surface or flush mounting. Again, round and square elements are used. The surface-mounted version consists of several components that can be cylindrical or rectangular with rounded corners. The concealed versions sit on a round rosette and only the handle is flattened. Various showers and shower sets from other series such as Rainshower Cosmopolitan or Power & Soul can be combined and supplemented. Here you will find, among other things, hand and overhead showers that fit perfectly in the series Lineare because of their round design and also convince by operating comfort: the spray types can be easily changed by just one touch of a button. Also for the tub, flush- and concealed-mounting fittings are offered. The surface-mounted version is as well available with a practical hand shower, which is mounted separately. A special eye-catcher and always a highlight in the bathroom is the freestanding bath mixer with a projection of 271 mm. It fits with the freestanding bathtub, above all, and stands on a round rosette. The height can be between 801 and 905 mm. The freestanding fitting is made up of several components and includes, in addition to the bath spout, a hand shower, a shower holder, a shower hose of 1,250 mm in length, and an automatic diverter between bath and shower. At least as elegant as the freestanding bath mixer are the three or four-hole single-lever bath combinations with and without baths spout. This one can then be combined individually. The flush- and concealed-mounted shower batteries can be supplemented by the single baths inlet, too. Also with the bathtub fittings, round and cylindrical shapes are elegantly combined with angular and flattened shapes. If you do not want to choose all of the Lineare faucets, or you do not find what you're looking for, you can also choose the Power & Soul Cosmopolitan showerheads and the Essentials New accessories, which includes a variety of handy accessories such as towel holders and soap dispensers in different colors. The accessories, depending on taste, set color accents and bring variety in the bathroom or inconspicuously complement the rest of the furnishings.